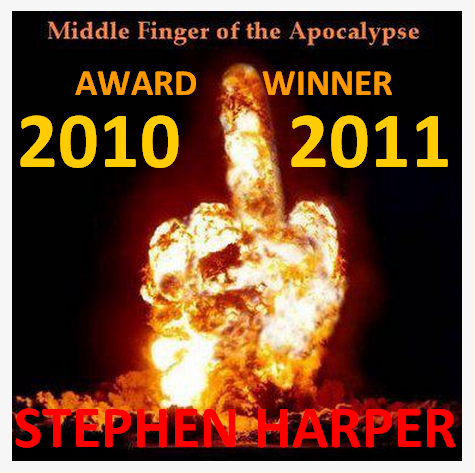 "Middle Finger of the Apocalypse Award"
To become a co-presenter click here! You may remember that he won it in a nearly unanimous vote in it's first year of presentation back in 2010 for his continuous and persistent hard work in the field of Democratic Contempt. But this year there were no real competitors, and he won it without even a single dissenting opinion, partly due to the recent passing of Osama Bin Laden and Moammar Gadhafi, both of whom captured several votes each in 2010, it's inaugural year. He was therefore, able to run completely away with the title this past year as he and his cronies were brilliant in their bid to bring new meaning to the words 'intransigence' and 'recalcitrance' in 2011, when he was yet again successful in keeping the Canadian citizenry as well as it's Parliament and all of the Officers of said parliament completely without relevant information. Not only has he once again been rewarded with the MFA but he reached another coveted milestone when his government (actually renamed in his honour as "The Harper Government" back in late 2010) failed to honestly answer even a single simple question for an unprecedented and world record setting period of just over five years. Couple that with his amazing ability to convince Canadians that he is a Christian, in spite of his lack of humanity, where he even goes so far as to feign a rather convincing and fervent belief in 'The Rapture', and his selection was an easy choice. It should however, be noted that a belief in the Rapture, is not strictly speaking a pre-requisite under the rules, but given the spirit of the award and it's connection to the Apocalypse it adds weight to the theme and he may therefore be in a position to repeat again next year and for many years to come. His impressive work with Israel whom he has undeniably helped bring within reach of a huge and glorious holy war with Iran and his innate ability to nurture conflict and division on a massive scale wherever he goes, has endeared him to all who long to see the world end in a fiery rain, whether heaven sent or by the hand of man. From the Editorial staff of T.T.S.M. Hi to everybody, I apreciate this hark work in this page, you are writing down with great writing! This blog is very helpfull! Holy Kent I love Your Blog! Good thing Harper sees the Rapture coming in a blaze of fire, 'cause seems to me that when the Big Guy holds him to account for what he's done/doing to this world, there's going to be hell to pay and his rapture experience will give him a bit of a taste of what he can look forward to heat-wise.